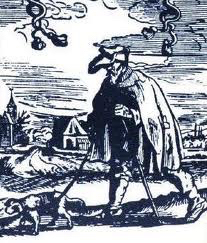 Image: blind man and dog, 17th century woodcut. No one gets a free pass to success in the Unites States, though we believe everyone is born equal. This is a conundrum for the blind who are unemployed at a rate estimated to be between 60 to 80 per cent. Equality, if you have a disability, means better social contracts between the governed and the government. Good governance is the key. Twenty years ago while I was working for a major guide dog school I visited a “sheltered workshop” for the blind in a major American city. I was shocked by the tin roof warehouse without windows where blind people hunched over sewing machines stitching flag decals for army uniforms. The working conditions were positively Dickensian. The manager of the operation was pleased as punch. The blind had jobs. The blind were laboring in the dark. The blind were making pennies on the dollar. I asked Mr. Gradgrind (for so I thought of him) “Where do your workers live?” knowing full well they couldn’t afford apartments on their wages. Let us hope these conditions are now all over.